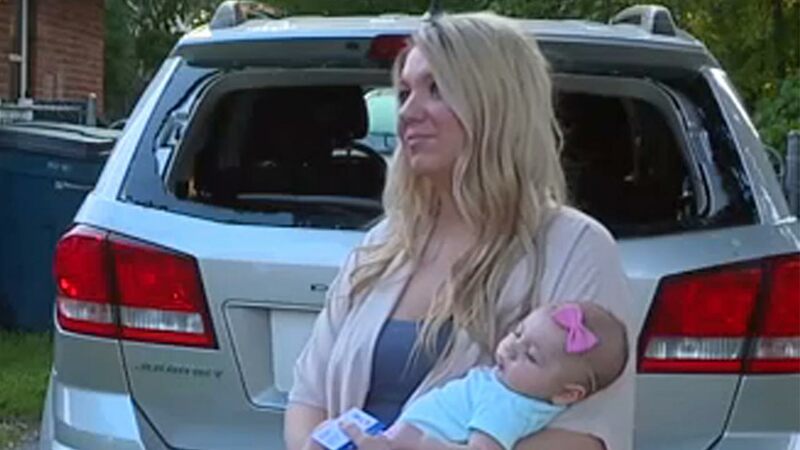 WATERFORD TOWNSHIP, Michigan -- A mother in Michigan had to rescue her newborn daughter she accidentally locked inside a hot car, after she got a shocking response from police. Lacey Guyton immediately called 911 for help, but instead of sending officers, the dispatcher told her to call a tow company. "It was terrifying," Guyton said. "It was like the worst day of my life." Guyton described what happened last Saturday as her worst nightmare. She was visiting her grandmother with her 2-month-old daughter when she accidentally locked the baby inside the car. "The keys are in my diaper bag," she said. "I put the diaper bag in the car, put Raina in the car, and then shut door. And then all of a sudden, it locks." "I need someone with sirens on their car that can move traffic over," Guyton said. "I don't have much time." However, she was surprised by what the dispatcher told her. "'We don't send people out to unlock cars or break windows,' and that she could connect me to a tow company," Guyton said. "I was so shocked, and like, OK, they're not coming." Guyton said she knew she had to save her daughter on her own. "I saw her start to close her eyes, and I just ran to the back window and smashed it open," she said. She said Waterford police later contacted her to apologize. "It's a common sense issue," Waterford police chief Scott Underwood said. "You call 911, you expect for somebody to come and give you some help. And we certainly should have gone and done that. We made a mistake, and we didn't. And we need to fix that." Guyton said the Waterford Police Department could've done more during her baby's life-or-death situation. "I do appreciate their apology," she said. "But it's not something that even needs any training to know. It's common sense. You send help when somebody is begging, you to come help them save their child out of a hot car."